Alpinestars has been at the forefront of the race to put airbag technology in motorcycle suits. They were the first to release this technology to the public, in a one-piece race suit called the Tech Air Race that came with a €6,000 price tag back in 2011. The Alpinestars Tech Air Race Suit. Alpinestars photo. Since then, we've seen numerous advancements that have made the technology smaller, cheaper, and easier to fit not only into full race suits, but also into jackets. Initially, Dainese was a little better at securing partnerships for its similar D-Air system, announcing deals with both Ducati and BMW at EICMA back in 2013. 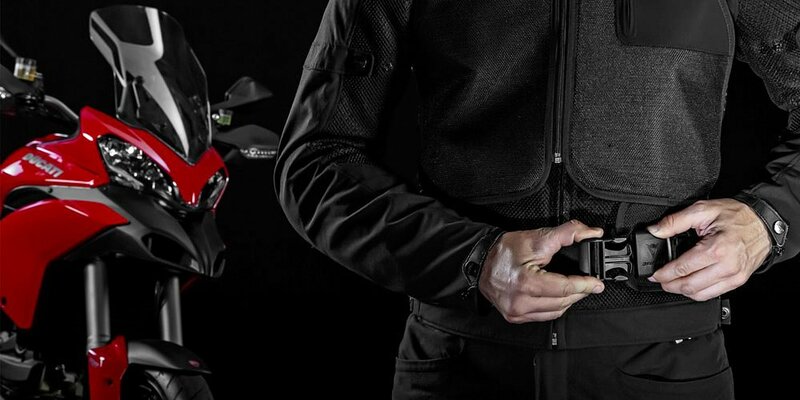 Then, last summer, Dainese and Ducati launched a much more public deal that created the Ducati Multistrada 1200 D-Air, a motorcycle with built-in sensors that connect to your Dainese D-Air gear for better response. When I saw the press release for this news, I assumed this would be a similar deal between Alpinestars and BMW, possibly even around BMW's new S 1000 XR. The Alpinestars Tech Air Jacket. Alpinestars photo. Unfortunately, it appears that this deal only brings AStars tech to BMW branded gear, in the form of co-branded jackets for both men and women that will be launched later this year. I can't say that's a bad idea, in and of itself, however. BMW owners as a group, even more so than Ducati, skew older, more prone towards using safety gear, and in higher income brackets, and I think BMW adventure or sport gear that matches the new R 1200 GS or BMW S 1000 RR will sell like hotcakes. The added benefit is that riders won't need to buy a new, special motorcycle to enjoy the benefits of airbag tech. Both Dainese and Alpinestars have been reluctant to bring airbag tech to our sue-happy culture, though Dainese has claimed to have plans to bring the D-Air to the United States by the end of the year. My source at Alpinestars says there are no plans to bring this line of BMW/Alpinestars gear to the states. Either way, I hope this is merely the start of a more interesting relationship that at some point matches or exceeds Ducati and Dainese's joint efforts.